Courses feature links to related resources on the Historical Society's website. The left-hand column features educator-prepared syllabi, lesson plans, teacher guides, and workshop materials along with a PDF that illustrates which mandates the course meets in the New York State K-12 Social Studies Framework (2015). The curriculum-related topics are listed below the PDF link. 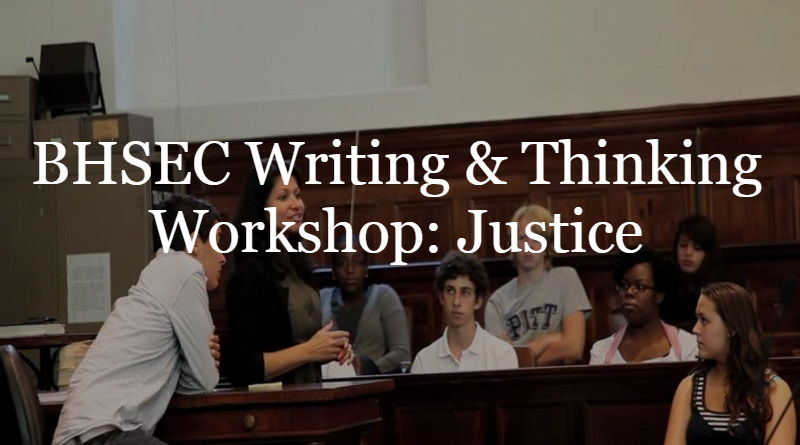 At the beginning of our partnership with Bard High School Early College, a public school with campuses in Manhattan and Queens that is operated with Bard College, we helped develop its Writing and Thinking Workshop on the theme of Justice. The accompanying Writing and Thinking Anthology: Justice features resources with topics of foundations; bioethics; sports and games; economic justice; intellectual property; copyright and fair use; and dilemmas relating to equality, religious freedom, criminal justice and immigration. These resources formed the basis of a week-long unit in which all the students examined the meaning of justice and the role of the courts in our society. In addition to classroom work, students had the opportunity to visit working courtrooms and speak to judges and lawyers on the judicial process. This partnership has proven fruitful and grown over the years. With the help of the Society, Bard has developed additional college-level courses for high schoolers in political science, literature, and history. We have included the courses, their descriptions, and pertinent materials below for teacher reference. In support of this curriculum, the Society plans to continue to connect students with judges, lawyers, and courtrooms. If you have used any of these materials in your classroom, we are interested in hearing your feedback. How did you adapt our resources to meet the needs of your classroom? What activities worked for you? What activities didn't work? We invite you to email us at the Historical Society of the New York Courts. This course focuses on the legal history of civil rights and liberties in the United States as well as the role of New York and its courts in shaping these rights. Through examination of the evolution of legislation and influence of court decisions, students gain a greater understanding of how laws and the people behind them affect American history and pave the way for the nation’s current freedoms, protections, and challenges. Students investigate the struggle for freedom, equality, and protection through activism, legislation, and litigation while learning to read and brief court cases and place them in their historical context. This course focuses on an examination of fiction and nonfiction texts published over the last decade. Its purpose is to examine how books are shaped by the market and the reading public through analysis of the text itself as well as reviews. Why do these works have mass appeal? Are the reviews and marketing strategies actually reflective of the books themselves? Will these books become a part of the literary canon or solely popular in the time they were published? This course explores changing markets as they applied to book publication. This course focuses on the many inequalities in American society. Ten percent of the population owns 71% of the country's wealth, while the bottom 40% own less than one percent. 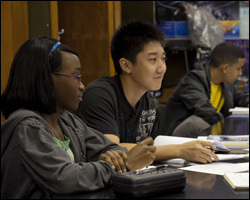 New York City's school-age population is over 70% African American; however, the student body of Stuyvesant High School, regarded as one of the city's best, is under four percent African American. Women typically earn 83 cents for every dollar men earn for comparable jobs. How should we deal with these and other inequalities? Should they be tolerated? Should they be changed? This course explores theories of egalitarianism and applies those theories to case studies of inequality in America. BHSEC welcomes new students each year with a Writing and Thinking Workshop in which students engage a topic in small groups and write, think and discuss the topic in depth. In 2010, the theme of this workshop was "Justice." Students read from an anthology of sources that included some of the most read texts on the subject, starting with Plato and covering the Founding Fathers to Bob Dylan. The students then explored these ideas in their classrooms and in visits to courtrooms in New York City. The Lemmon Slave Case provides students of U.S. history a window into the legal challenges and moral conflicts over slavery before the Civil War. This case requires a close examination of federal and state law. The New York courts freed slaves brought into the free state, while the United States Supreme Court decided Dred Scott was not free though he had traveled to a free state with his master’s family. Many curricula place a strong emphasis on the Dred Scott decision, but the Lemmon case shifts focus to New York and allows students to contemplate state’s rights implications and the interpretation of the law through a lens of human equality. 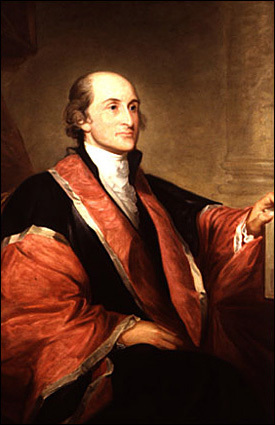 The case of People v. Croswell discusses concepts of criminal libel and sedition, in which Harry Croswell was accused of publishing defamatory statements about President Thomas Jefferson. Croswell’s defense argued that the charges were relics of an unenlightened era, where power and politics trumped reason and truth. Both in legal opinion and in the popular press, this unit, and these disputes, expose different perspectives on the relationships between truth and calumny; evidence and opinion; and national security and First Amendment rights. Our scholarship, specifically offered to CUNY Two-Year Community College students, is located here. There you will find materials developed for our annual scholarship on various topics of New York State legal history as well as the essays written by past winners. Our partnership with Bard College Institute for Writing and Thinking prepared the Justice and the new York Courts workshop to provide professional development opportunities to educators who want to bring writing-rich pedagogical strategies into the classroom through the teaching of primary historical legal sources. As the teachers sought answers to the questions of the nature of an independent judiciary and its critical importance to the Federalist system of checks and balances, they prepared the sample student lesson plans below. For more information about about our professional development workshops, please visit Teacher's Workshops.